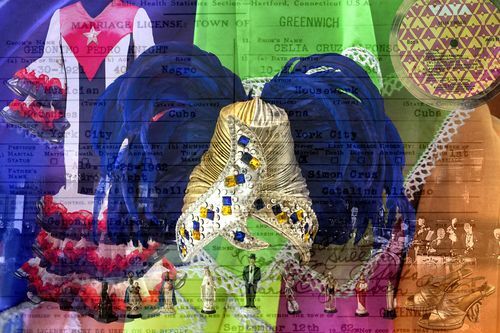 MIAMI, Florida/ October 3, 2012 Celia Cruz Foundation-The Smithsonian’s National Museum of American History unveiled an object-based portrait of Celia Cruz featuring artifacts displayed in the museum. The Smithsonian collaborated with photographer Robert Weingarten to create the portrait. It’s a pop of vivid color and glimmering textures, tinted with memories of home, heritage, and, most of all, music. This biographical portrait by artist Robert Weingarten depicts Celia Cruz, the Queen of Salsa, and was unveiled this morning. It will be on display until May 2013. We hope you like it because you, readers of the blog, voted for it. We asked you to pick which of five iconic American figuresshould be memorialized in a new Weingarten portrait and Cruz’s multifaceted story of immigration, music, and entertainment resonated with the most voters. “This was the first time I’ve agreed not to pick who I was working with,” said Weingarten, who listened to Cruz’s music as he worked. Unlike most portraits, Weingarten’s don’t include an image of the subject. Instead, photographs of objects, documents, and other symbols that represent the person are layered into a composite image, conveying the individual’s biography in a unique way. Weingarten usually asks his subjects to give him a list of items that answer the question, “If you could do your self-portrait… what would be on the list that would represent you?” Photographs of the individual, their family members, and pets aren’t allowed and the list must not include more than ten things. He describes this process as “somewhere between portraiture and self-portraiture.” Blog readers provided Weingarten with a list in the case of the Cruz portrait and their comments revealed many ways of looking at Cruz’s biography. The museum provided curatorial expertise and access to Cruz’s objects in the collection. This world cloud represents blog readers’ comments about what was so important about the life of Celia Cruz. Others referred to her modesty, her African-Cuban roots, her humanitarian work, her trademark “Azúcar!” shout, and her flashy, eye-catching wardrobe. “I think you captured Celia’s soul and life very well,” said Omer Pardillo Cid, President of the Celia Cruz Foundation to Weingarten. 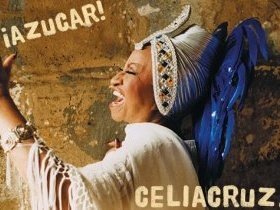 ← Celia Cruz to be honored at largest Cuban festival in U.S.